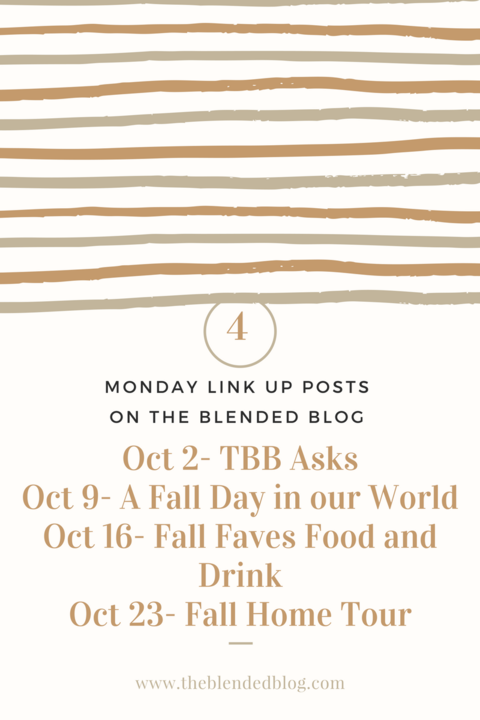 It's the first Monday of the month, so time for a little Q and A with The Blended Blog. HOW is it October? Be sure to head to The Blended Blog to link up your posts, and mark your calendar for November 6th when we'll be back with new questions! Fave sweet treat? Hmm...everything? I'll say Pumpkin Spice Cupcakes with Cream Cheese Frosting, because I had one yesterday and it was delicious. Apples? All the apples are good! Fuji's are my favorite. Best drink for fall? Hot apple cider. 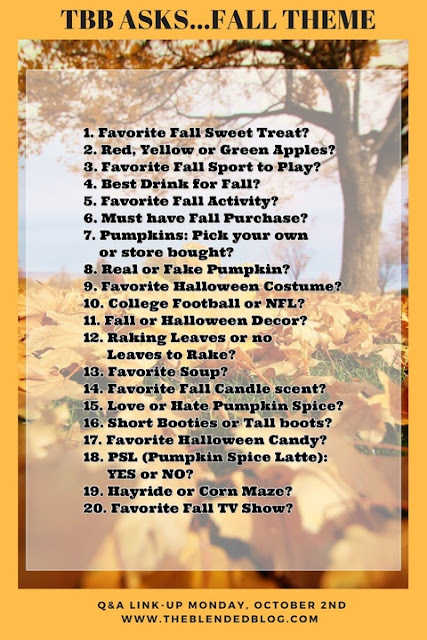 Favorite fall activity? Going for a walk on a crisp, sunny day. Must have fall purchase? Booties and sweaters. Pumpkins: pick your own or store bought? Gotta pick your own from the pumpkin patch! Real or fake pumpkins? I've got plenty of fake ones inside, but for the front porch it's got to be real. Favorite Halloween costume? There have been so many good ones over the years, but my favorite was Thomas' zombie Michael Jackson. 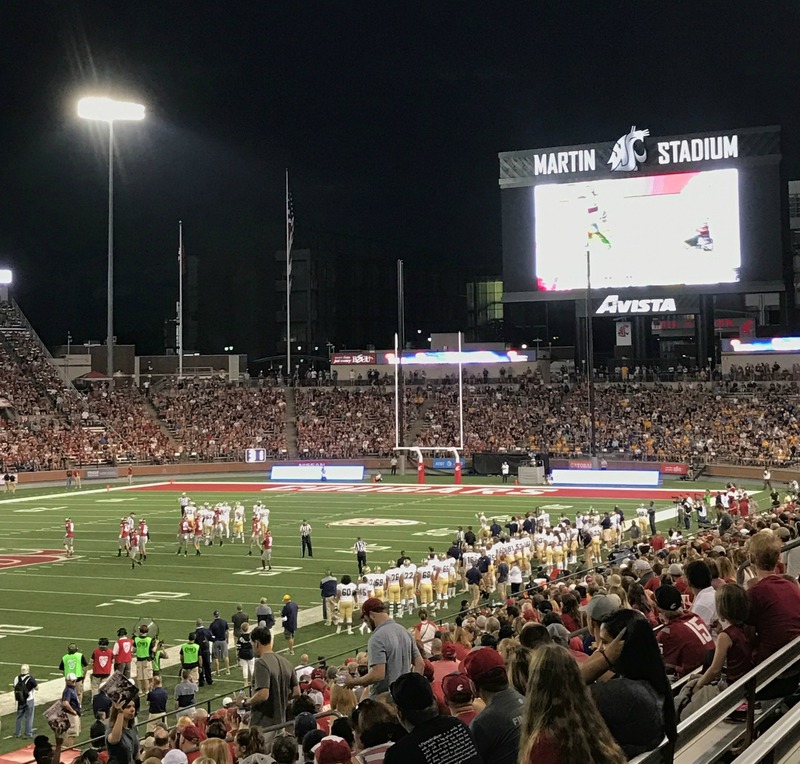 College football or NFL? I love my Seahawks, but I love the WSU Cougars even more. Nothing like college football under the lights. Fall or Halloween decor? Mostly fall, although I have a few pieces I put out to scare the trick or treaters. Raking leaves or no leaves to rake? We have mostly pine trees in our yard, so no leaves to rake. Favorite soup? My husband makes the yummiest Cream of Watercress soup. Need to request that soon! Favorite fall candle scent? Is there anything other than Pumpkin Spice? Love or hate pumpkin spice? Meh. Except for that cupcake. Sorry Andrea - can we still be friends? Short or tall boots? Both. Love all the boots. Favorite Halloween candy? Candy corn pumpkins. Pure sugar. PSL - yes or no? Nope. No latte, no pumpkin spice, no coffee for me. Hay ride or corn maze? Corn maze, especially a haunted one! Favorite fall TV show? I was looking forward to Will and Grace, but the first episode was kind of disappointing. Love The Goldberg's. That was fun! Be sure to join us on Mondays in October for some fun topics. BH ha ha, of course we can still be friends and we will just have the Pumpkin Cupcakes with cream cheese frosting!! YUM!! I too was disappointed with Will and Grace but give me Beverly Goldberg anyday who my husband says I am just like, LOL!! Have a marvelous Monday!! Isn't Beverly Goldberg the best?!? Haha! No PSL, seriously?! I hope you enjoy fall baking! I have never ever had Cream of Watercress soup or heard of it, is that weird? It sounds really good though! I can't remember why my hubby started making that soup, but it's SO good. And fall baking always makes the house smell so good! I would love to Thomas as Michael Jackson zombie! I bet it was fabulous! I need to go look for a picture - he was adorable! Great list. Cute dog. Love those pumpkins!! Pumpkin spice cupcake?!? Oh my yum!!! My husband calls me Beverly Goldberg sometimes too, but I'm more of a Sue Heck (from The Middle) haha. I'm still thinking about that cupcake! That puppy picture is too too cute! I love the candy corn too but I am not a fan of anything pumpkin except a Jack o Lantern. The laugh track on Will and Grace ruined it for me. She was such a cute puppy! Yah - everything about Will and Grace was a disappointment. I'm just not a PSL kinda girl, either, but it seems that they are very popular this time of year! I don't like any coffee at all - give me Diet Coke any day :)! Honey crisps and hot chocolate are definitely yummy! I like anything George makes. 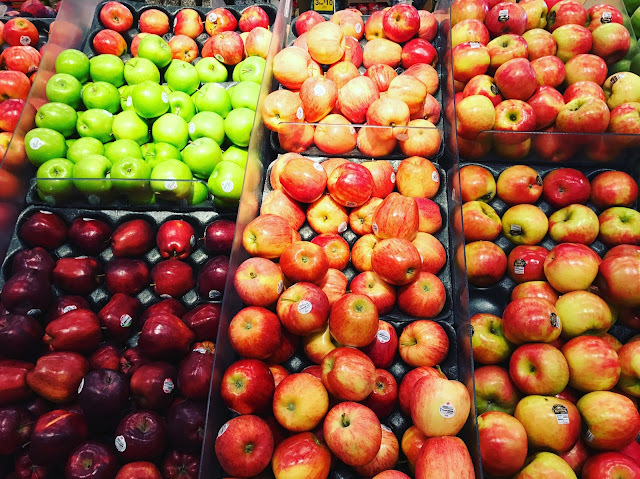 I love Gala apples but Fuji’s are a close second. Hot apple cider is also one of my favorite fall drinks, I might make some tonight. I’ve already been eyeing some cute booties and sweaters to add to my overflowing wardrobe. So you are a Seahawks fan??? Nice, even though we are division rivalries I love your team and what it stands for, you have a great coach, a great defense and your quarterback is a class act. I’m scared to watch Will and Grace, if it’s bad it will be a huge let down. Honestly, all apples are good! Love the Seahawks here in Seattle - especially Russell! Sadly, I was disappointed by Will and Grace. I rarely have it either - although I usually make a big pot on Halloween. This is fun! I may have to join. We got Fuji apples over the weekend. They were phenomenal. Picked them ourselves! The photo with the puppy and the pumpkin. AW! I agree about it's gotta be real. 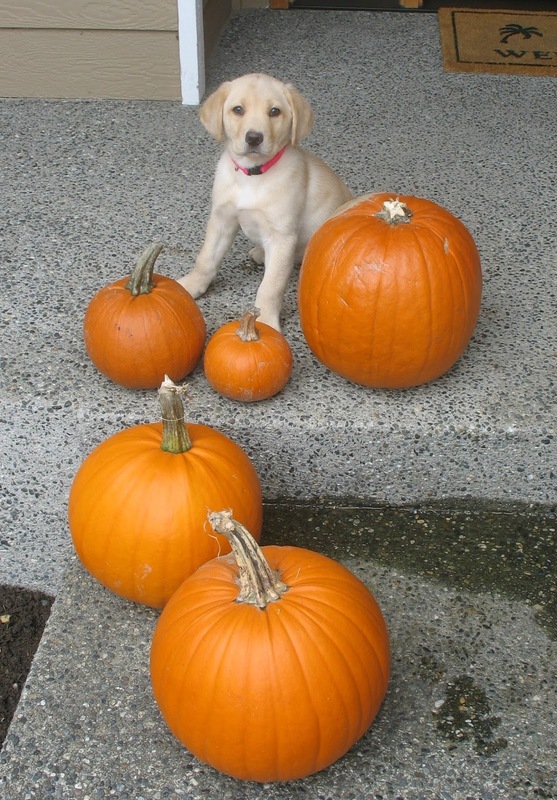 She was such a cute puppy and sat so nicely by the pumpkins. Now she hates getting her picture taken! I love a good haunted corn maze! Great list! !